tapping into "low pressure" line easier than "high pressure"
I spent a couple of hours trying to figure out how to best connect/disconnect it and finding pieces that will fit, and figured I'll share since I haven't seen a good parts list in any other relevant ports on this potentially saving somebody some time. the T is 3/8 NPT Flare connection. Took a bit of muscle to take off the cap. I have purchased the following, listing in order of connecting from the T.
Please note, because the T is 3/8, while typical "quick connect" RV propane devices are 1/4". Additionally, you want to make sure you use flare connections where flare is used. Notice different ends, the 1/4" male is needed for typical quick connect adapter. The male part would be discarded, or you could find just the female part for a few bucks less. * hang the heater on the bathroom mirror, or put it on top of the fridge. Quick connect whenever needed. I believe my preferred placement is top of the fridge. I really don't want this below waste due to animals and child. Through my research, I have also found a vendor that sells a kit for this, which is rather similar to what I came up with, except uses copper tubing and an additional tee to allow further expansion (additional tee is in my plans, as I plan to use an EU2200i generator with propane upgrade kit from Hutch Mountain). It seems to be almost 2x the expense over above, but maybe quality is higher. The power entry is real tight. 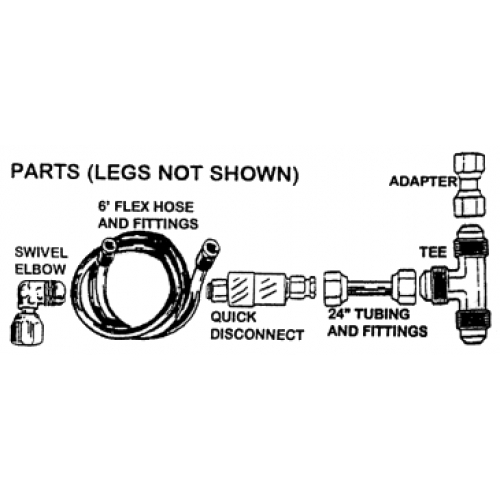 Slightly thicker hose, or one with quick connect attached would not fit. I had to use spud swrench to make some room, vise grips to shape wires and hose together, muscles to push jose through, and needle pliers to pull from the other side. I would also probably get a longer than 5ft cable if I had to do it again, or even better stick to copper as it would be thinner. Lastly, while this takes care of immediate needs, I think I would prefer to tape into the fridge line. Just need to figure out how to secure quick connect in a wall. I don't mean to be harsh but this appears to completely violate everything I have read in RV gas (safety) codes concerning materials and joining. None of this material is designed for this application. If the flexible hose or that joint in the closet develop a leak it will spray propane inside the trailer. Working the hose with tools and then forcing a tight fit through a cable grip, and the fittings and hose inside the trailer are not things you should trust your life on. Running the hose across the doorway isn't a good idea either. I don’t wish to be harsh either but after looking at your photos the first thing that popped into my head was Rube Goldberg. It's important to note that unlike the Mr Buddy heaters, the Wave 3 does NOT have an O2 sensor. It's even more important to make sure that you have a little bit of ventilation and at least one working CO detector, or it will probably kill you. Casita are equipped with propane leak detectors. Will likely redo with copper around fridge like I already mentioned. Just need to figure out the logistics. CO2 is carbon dioxide, the stuff you exhale. I am concerned because of the potentially significant risk in this arrangement. The proper materials and procedures are to be found in NFPA 1192, Standard for RVs, which serves as a Plumbing, Propane and Fire & Life Safety code. Please talk to a licensed plumber or a certified RV technician, someone who is trained and qualified to give you an objective and informed view here. Travel warm and safe and happy. I haven't worked on re-design yet, but the setup worked OK Fri night and Sat night as temperatures got down to around 30 each night. The 3000BTU were not enough to keep Casita warm, but the furnace only needed to kick in a handful of times to keep temp around 65F. Thanks for pointing do regulation, I will review. I've seen some people install these things in casitas, I like the quite aspect but you have to vent to allow adequate air and then the put out a bunch of moisture in such a small cabin. Running the line in through the front like thant looks like a problem. Perhaps better to t off the furnace of the frig. I never got to the point of installing one, having purchased a lil buddy. I installed a Wave 3 in our Scamp in 2008 using copper plumbing, flare fittings, etc. doing my best to comply with good installation practices. We used it a number of times, but never trusted it for sleeping. You will need ventilation, both to help with condensation, and to help get rid of carbon monoxide, which these heaters DO produce in small amounts. I installed a CO detector with digital readout, and it consistently showed small amounts of CO. The levels were below the threshold for setting off the alarm, but there was definitely a measurable amount of CO present. It became a "daytime only" heater for us. I've attached a report showing some actual measurements from catalytic heaters in a controlled environment. Good luck. We make our own choices, but I personally would not trust any open flame heater for nighttime use, especially in the confines of a small camper. Like I said I have a little buddy but we dont run it at night, If I could I would check out this system. I have the same heater in my mid 80's vintage 16ft Standard Casita. It was in the the trailer when I bought it. It was mounted to the original fiberglass lower kitchen cabinet, next door to the fridg. Because my trailer was a basket case that need a total resurrection from being landfill fodder, I took the liberty to rearrange the interior which ended up moving the heater so I am very familiar with the parts used to connect the heater. With the exception of the quick disconnect shown in the parts illustration, the fittings match what is used to connect my heater. Is that illustration from an instruction sheet that comes packaged with the new heater? Similar to what others have mentioned, the gas plumbing connection to the original gas supply copper line is made inside of my trailer. I mention that only as an observation not as a criticism in any way. Overall, I like the heater. It puts out enough btu's for the early spring thru late fall camping that we typically do along the west coast of the US. I have bumped my leg against it while it was burning several times and was never concerned about getting burned. However I wouldn't trust it around a toddler. Our heater is only used during waking hours as we don't trust it enough run it overnight. It's not a problem since we as temperate climate boondockers do fine with our warm woolen blankets and would rather use the propane for purposes that does not include keeping a gas heater burning all night.